Head over and take this survey to score a coupon for a FREE Box of Van’s! Only 5,000 coupons will be sent, so hopefully you snag this in time! 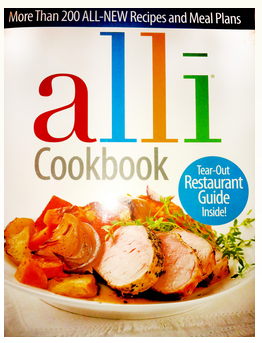 Head on over to Facebook to grab a FREE Alli cookbook by mail. Make sure to select “RETURNING USER”. 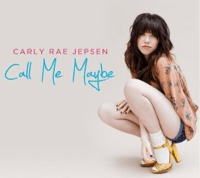 Amazon: Select MP3 Songs just $0.25 Each! Music fans should definitely take advantage of the Amazon MP3 deal! Amazon has 20 Go For the Gold songs for just $0.25 each! Or grab that whole playlist for $5! 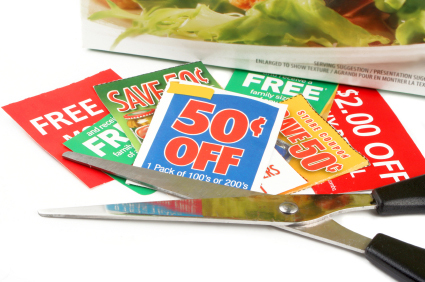 Don’t forget about your $5 Amazon gift cards from Swagbucks and SuperPoints! https://savvywifehappylife.com/wp-content/uploads/2016/09/SavvyWifeHappyLife-logo-2.png 0 0 Brandi https://savvywifehappylife.com/wp-content/uploads/2016/09/SavvyWifeHappyLife-logo-2.png Brandi2012-07-31 17:49:172012-07-31 17:49:17Amazon: Select MP3 Songs just $0.25 Each! At 4 PM EST, hurry on over to score free samples Tampax Radiant on Facebook! Log in or sign up for My Coke Rewards to add 40 FREE points to your account! With those points you can get a coupon for a FREE 20 oz drink OR McDonald’s McBites. This weekend turned out to be a fun thrifting weekend! Luckily, I got over my fever and sickness and was all ready to hit the good deals! On Saturday morning, Mike and I met our friends at the flea market. 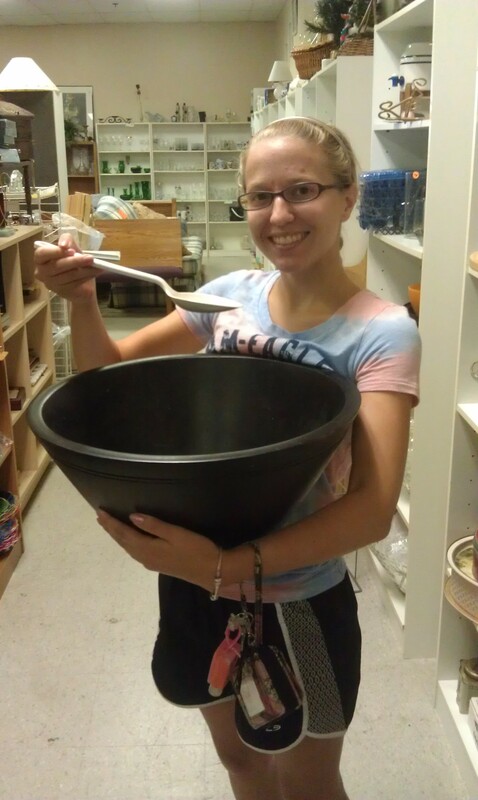 I didn’t end up buying anything there, but my friend got a little Pyrex casserole dish. On our way back home, I spotted a sign that said “Free Family Flea Market —>”. We turned around in Lauer’s parking lot (and we had to walk in and buy a box of dounts -darn their bakery!) and headed off in search of this flea market. I was thinking “Free Family Flea Market” meant that it was a free space for families to come sell their belongings… but I was wrong. We got there and it was crowded as anything… because… EVERYTHING WAS FREE. Crazy, huh? There were a few long tables full of household goods, tables of books, tables of junk, and a huge tarp of clothes and shoes. There was live entertainment and free food and drinks. Donations were accepted and went towards the church who helps out a shelter for men who are recovering from addictions, abuse, etc. Overall, there was a lot of junk, of course, but it was a great event for people who don’t have any money. There were dish sets, holiday decorations and plenty of clothes and shoes to go around. We ended up with a few wool sweaters, a couple baskets, plastic gift bags, a SAT Prep book for my sister (not pictured, oops), and turtle and dino cookie cutters. 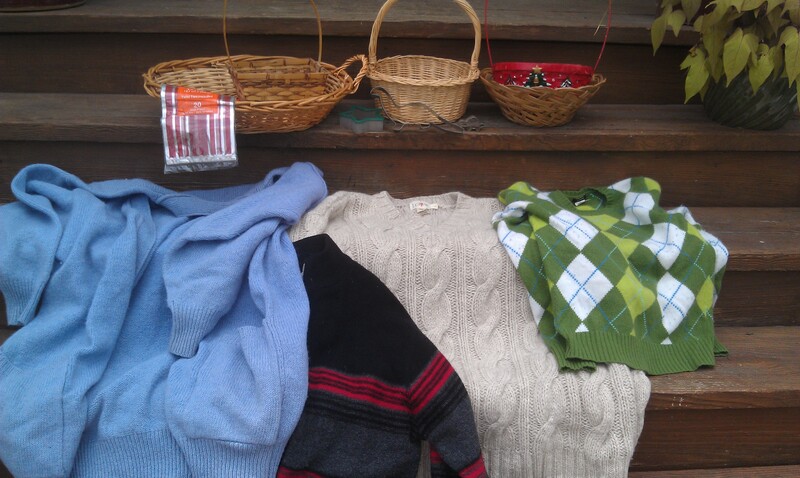 I always buy cheap wool sweaters when I can, but free is better! 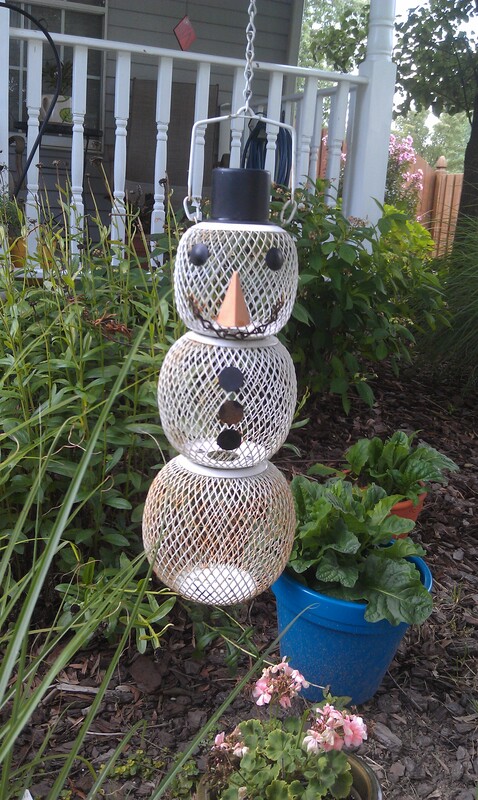 I use wool to make the Wool Dryer Balls, but there are so many uses for wool. If you’re frugal and/or crafty, never pass up a cheap/free wool sweater! They can be re-purposed into mittens, hats, dryer balls, wool shorties/longies for babies/toddlers, stuffed animals, purses, and much more. And lastly, on Sunday I stopped at the flea market real quick on my way to a party. I grabbed a Pyrex Woodland Cinderella Bowl for $2. It’s in pretty good condition. I’m not usually a fan of the browns, but the pattern kind of strikes me. My mom technically bought it, so it’s “her’s”. I think it would look really pretty with a matching pink bowl 🙂 The lady wanted $3 for it, but asked her if she would take $2. She said she would because I always ask her that. Now people at the flea market are recognizing me… this can’t be good, can it?! Going to the flea market pretty much every weekend, you usually see the same ‘ol things, same set ups, etc. But on Sunday morning 2-3 “spots” were taken up by ROWS of boxes filled of junk -amazing right? The boxes were from a company who (I assume) purchases estates and old antique stores and then resells the junk. I quickly skimmed through all of them looking for anything good. 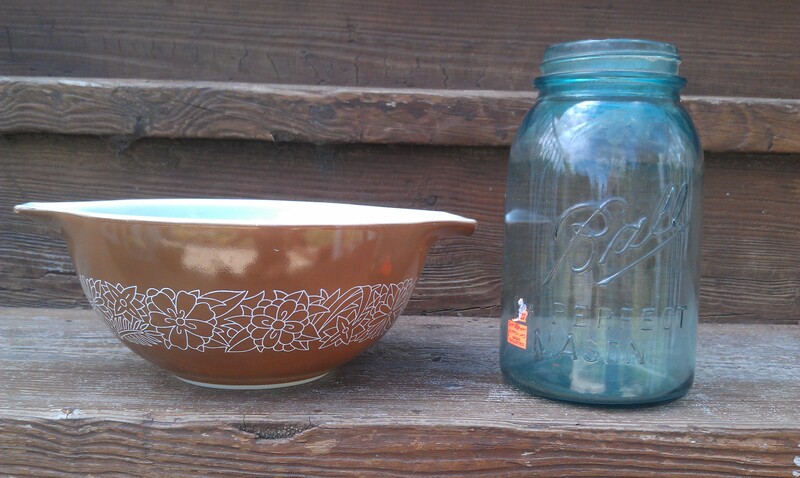 I found an antique blue Ball jar and got it for $1 -yay! It had a price tag from some antique store for $26! I love these pretty jars. I’ll probably use it as a flower vase. It was ironic because 4 minutes before rummaging through those boxes, I was telling my mom how mad I was about passing up the $2 blue Ball jars last month. Luck was on my side! 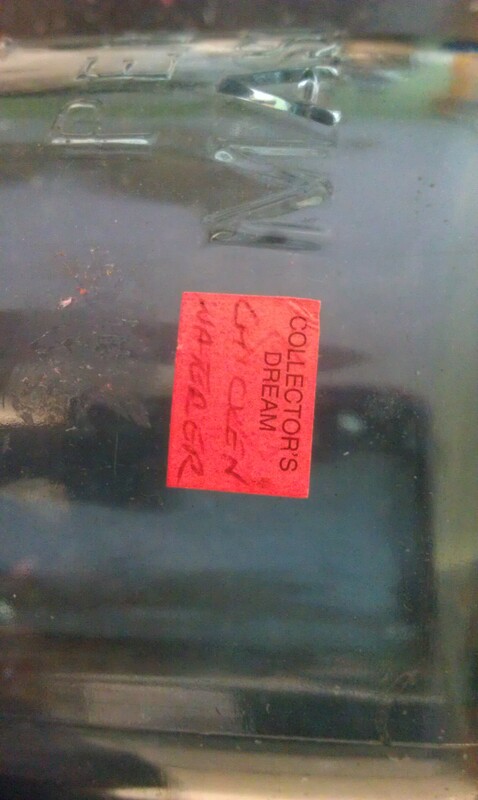 Underneath that price tag sticker was another sticker that read “Chicken Waterer”. I thought that was kind of interesting! Sorry for the long post, but it was a good thrifting weekend! I hope I am inspiring some of you guys to go out thrifting 🙂 It’s truly a treasure hunt every single time. Feel free to leave comments and tell me about your thrifting adventures! (Ends Tonight) FREE $10 Prepaid American Express Card (For Loading a $50 Card)! You’ll need to head on over HERE and order a new card. This is for any person, you don’t have to have an American Express card already. I do not! You’ll need to load $50 on this card. That’s the hardest part. Some people don’t want to spend $50 today, but in a few weeks, you get $60 back. It’s a win-win situation, if you can “give up” that $50 today. You’re not losing anything! Order an American Express Prepaid Card, load $50 or more at the time of order, and receive a complimentary $10 gift card. Limit one (1) offer per Card. After qualifying for this offer, please allow 6 weeks for the $10 Gift Card to be mailed to the Card purchaser. https://savvywifehappylife.com/wp-content/uploads/2016/09/SavvyWifeHappyLife-logo-2.png 0 0 Brandi https://savvywifehappylife.com/wp-content/uploads/2016/09/SavvyWifeHappyLife-logo-2.png Brandi2012-07-31 14:02:412012-07-31 15:32:13(Ends Tonight) FREE $10 Prepaid American Express Card (For Loading a $50 Card)! https://savvywifehappylife.com/wp-content/uploads/2016/09/SavvyWifeHappyLife-logo-2.png 0 0 Brandi https://savvywifehappylife.com/wp-content/uploads/2016/09/SavvyWifeHappyLife-logo-2.png Brandi2012-07-31 13:28:442012-07-31 13:28:44Print Your End of the Month Coupons! 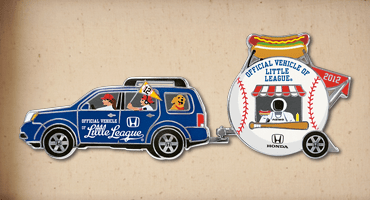 Go here to request a FREE Little League Baseball Collector Pin, courtesy of Honda. Very cute! 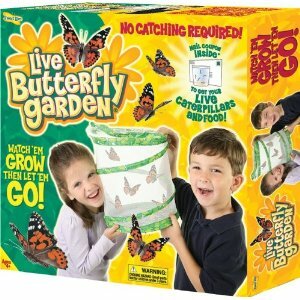 Amazon: Live Butterfly Garden just $12 (Reg. $25)! Amazon has this Live Butterfly Garden marked down to just $12, from $25 today! This kit comes with a observation chamber, supplies for feeding the butterflies, an informative booklet, and a certificate that you send away for caterpillars! Your kids will be able to watch the metamorphosis from larva to butterfly which takes about three weeks. Then they can then release the butterflies! My sister had one of these last year and it was really neat to watch! It’s great for teachers and parents. Use Amazon gift cards from Swagbucks to get this for free! https://savvywifehappylife.com/wp-content/uploads/2016/09/SavvyWifeHappyLife-logo-2.png 0 0 Brandi https://savvywifehappylife.com/wp-content/uploads/2016/09/SavvyWifeHappyLife-logo-2.png Brandi2012-07-31 13:03:122012-07-31 13:03:12Amazon: Live Butterfly Garden just $12 (Reg. $25)!